With only recent British experience to guide him, Wilson led Congress, his administration, and the entire American people in one of the speediest and most successful mobilizations for war in history. Congress approved a selective service bill on 18 May 1917, and the War Department set about systematically raising an army of 3 million men. Congress gave Wilson full power over the production, distribution, and prices of food and fuel supplies in the Lever Act of 10 August 1917. Food and fuel administrations mobilized and stimulated production to such an efficient degree that there was never any real danger of critical shortages of fuel and food for the American people, the American army, and the Allies. Through various instrumentalities, but most notably the War Industries Board, Wilson maintained a steady supply of raw materials to war industries. Substantial labor peace was maintained in 1917 through the Labor Department and in 1918 through the National War Labor Board. Wilson launched a large shipbuilding program at the outset of belligerency and, in December 1917, took over operation of the railroads. To pay for this gigantic mobilization, the Treasury Department raised some $23 billion through the sale of bonds and an additional $10.5 billion through heavy taxes on incomes and business profits. To persuade the public, still badly divided over the wisdom of participation, Wilson established the Committee on Public Information to undertake a nationwide program to convince Americans that they were fighting for justice, peace, democracy, and their own security in the world. To stamp out active opposition to the war effort, Congress adopted the Espionage Act of 15 June 1917 and the Sedition Act of 16 May 1918. The direct threat to the American and Allied cause in the spring of 1917 was the German submarine campaign, the results of which at first exceeded German expectations. Against British opposition, Wilson insisted upon the institution of the convoy system. Wilson had his way in July, and the Navy Department suspended construction of capital ships and concentrated upon destroyers and smaller antisubmarine craft. The convoy system brought the submarine menace under control by the autumn of 1917 and eliminated it almost entirely by the spring of 1918. In addition, pooled American and British shipping transported nearly 2 million American soldiers safely to France and maintained the flow of American supplies to the Allies. The American Expeditionary Force, under General Pershing, first saw active service before Paris during the Second Battle of the Marne (21 March–6 August 1918). In mid-August, Pershing's First Army, some 550,000 strong, joined the British and French in a broad counterattack against the German lines. By late September, Pershing's force numbered 1.2 million men; by 1 November it was near the German frontier. American manpower gave the Allied-American armies a predominance of 600,000 soldiers on the western front and turned the tide of battle decisively against Germany. In his war message to Congress, Wilson had declared that the war aims of the United States were the same as the ones he had enunciated in his Peace Without Victory Address of 22 January 1917. Thus, from the outset of American belligerency, Wilson dissociated his government from the secret treaties and war aims of the Allies and declared that the United States was an associated, not an Allied, power. This meant, theoretically, that the United States was free to wage its own war and to conclude a separate peace when it had achieved its ends. Of course, it was not possible to be so disengaged. The United States was also committed to total defeat of Germany if necessary, and the only way to wage a total war in the circumstances was through close cooperation, diplomatic as well as military, with Britain and France. This fact became clear when Pope Benedict XV, on 1 August 1917, called for peace very much along the lines of Wilson's Peace Without Victory Address. Wilson responded as warmly as he thought prudent; when Britain and France rebuffed the pontiff, Wilson had to console himself with the thought that the Allies would be in his hands "financially" at the end of the war and that he could force them to accept his own peace terms. Wilson was spurred to an independent peace campaign in response to the Bolshevik takeover in Russia in early November 1917. The Bolsheviks, or Communists, appealed to the war-weary peoples of Europe to stop the fighting, called for a general peace conference, and opened separate peace negotiations with the Central Powers. Unable to persuade the Allies to join him in returning a positive response, Wilson went before Congress on 8 January 1918 to announce in precise terms what the United States was fighting for. This peace program, embodied in fourteen points, called for, among other things, an end to secret diplomacy, freedom of the seas, drastic reduction in armaments, an independent Poland, and a "general association of nations . . . affording mutual guarantees of political independence and territorial integrity to great and small states alike." The Fourteen Points Address at once became the great ideological manifesto of the war and the rallying cry of liberal and labor groups throughout the world. Moreover, in subsequent addresses Wilson challenged the German and Austrian governments to avow their war aims and, better still, to join him in an irresistible campaign for a reasonable peace. The Austrian emperor, Charles, responded warmly and seemed ready to conclude a separate peace based upon the Fourteen Points. However, the French government finessed Charles's move by announcing to the world that the Austrian emperor was eager for peace. Charles could now only proclaim fervent loyalty to his ally, Germany. The Germans responded to Wilson's appeal with the imposition of the punitive Treaty of Brest-Litovsk upon Russia on 3 March 1918 and with their own peace offensive—the Second Battle of the Marne, designed to knock France out of the war before substantial American help could arrive. As Wilson said sadly in an address on 6 April, the war now had to be fought to its bitter conclusion. And so it was. As has been said, the second German Marne offensive failed, and the Allies, in July 1918, began a broad counterattack that ended with the armistice. During the height of the Second Battle of the Marne, the hard-pressed British and French put heavy pressure upon Wilson to join the Japanese in opening a second front in Siberia, in order to prevent the transfer of German troops from Russia to the western front. Wilson suspected, rightly, that the Allies wanted the United States and Japan to make war against the Bolshevik regime. Wilson thought that Allied hopes to reestablish the eastern front were futile and foolish. He also believed very deeply that the Russian people had the right to work out their own destiny and to establish any kind of government that they pleased, without any outside influence or pressure whatsoever. Hence, he vetoed all suggestions for a Siberian operation. Wilson relented slightly under the pressure of events in the summer of 1918. A force of seventy thousand Czechs, former Austro-Hungarian prisoners of war in Russia, had banded together in what was called the Czech Legion and were fighting to escape along a route from Russia proper to the Siberian port of Vladivostok. Wilson, in a memorandum of 17 July 1918, announced that he would send a small force to Vladivostok to guarantee the safe exit of the Czechs; he also invited the Japanese to join him in this limited operation. In the same memorandum, Wilson reiterated his intention to oppose all efforts to interfere in Russian internal affairs. Wilson was motivated in large part by the suspicion, which turned out to be well grounded, that the Japanese had designs on Siberia. Thus, Wilson, while he sent only seven thousand men to Vladivostok, did his best to keep the Japanese contingent to the same size. However, the Japanese government eventually sent in seventy thousand men and seized northern Manchuria and eastern Siberia. Wilson, in August 1918, also sent four battalions from Pershing's force to Murmansk and Archangel in northern Russia to cooperate with British and Czech forces there to safeguard large munitions supplies against capture by the Germans. 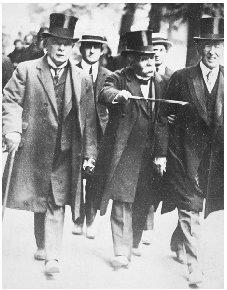 President Wilson (far right) strolls with David Lloyd George of Great Britain (far left) and Georges Clemenceau of France during the Paris Peace Conference following World War I.
based upon the Fourteen Points Address and subsequent speeches by Wilson. Wilson kept in close touch with Allied leaders during the negotiations that followed. Once Wilson was convinced that the German government was prepared to admit defeat, he sent Colonel House to London to obtain British and French consent to an armistice agreement. House claimed that he had won a diplomatic triumph when the British prime minister, David Lloyd George, and the French premier, Georges Clemenceau, agreed to make peace upon the basis of the Fourteen Points. The British said, though, that they would not be bound by the point concerning freedom of the seas, and the French won House's and Wilson's approval for a stipulation to the effect that the Germans should be liable for all civilian damages caused by their aggression. More important, the military and naval terms of the armistice agreement left the Germans powerless to wage even defensive war in the future. Nonetheless, German representatives signed the armistice agreement on 11 November 1918.
aims of woodrow wilson plz got test tomorrow what are the aims ?